This pattern was originally published as Pearl Fiber Arts’ contribution to the 2018 Rose City Yarn Crawl, March 1 – 4, 2018 in Portland, Oregon. 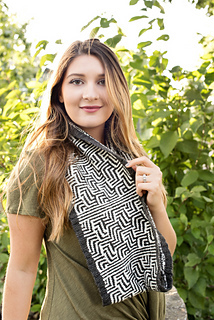 Each shop’s pattern(s) will be available free with purchase at that shop during the Rose City Yarn Crawl. 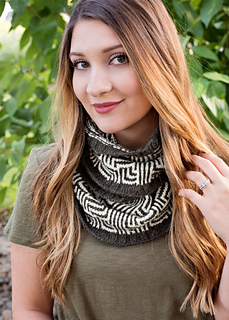 All patterns will also be available for download individually or as part of our 2018 Collection: Waterways: 2018 Rose City Yarn Crawl Pattern Collection. Silver Falls State Park is a gem that’s an easy day trip from Portland. Winter Falls is one of 10 different waterfalls in the park, most of which are accessible via good trails even a non-hiker can navigate. 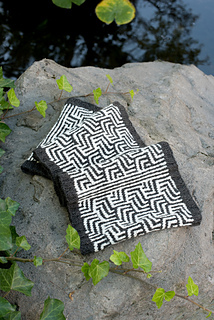 Water tumbling over the rocks is the inspiration for this cowl. It’ll keep you warm as you enjoy all the Northwest outdoors has to offer. 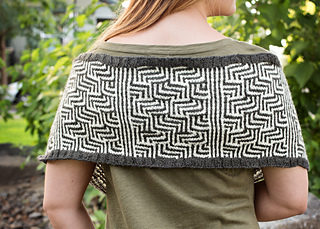 This simple to knit pattern uses slip stitches to create the pattern, so you only work with one color at a time.